I am always searching for old ORIGINAL photos or documents (that are from Cyprus and date before 1950). Unfortunately I can not always travel to people’s houses with my laptop and scanner so I have created the following instructions to help anyone who may have the technology to scan the photos themselves and then send me the files electronically using the internet. 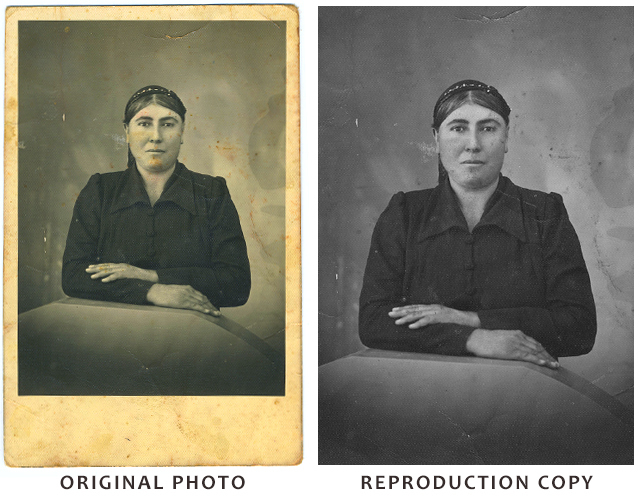 Firstly, how can you tell if a photo is original? Good question. Some times, people tell me they have an ORIGINAL old photo but when I arrive at their place I discover that all they have is a black and white reproduction. If you are unsure, here are some obvious clues to help you determine whether your photos are indeed original. 1. Original old photos are usually sepia or slightly yellow in colour. 2. Original photos usually have crinkled or uneven edges. 3. 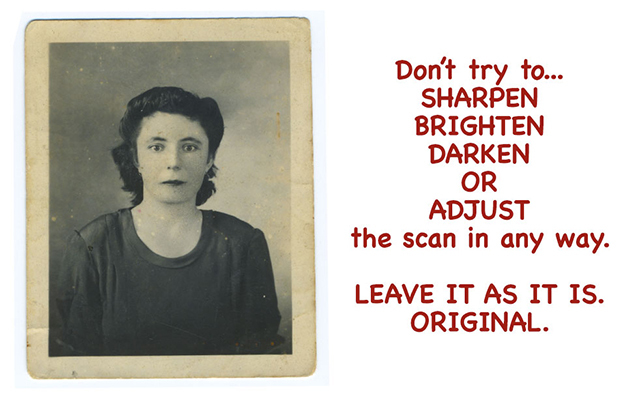 Original photos usually have signs of age such as tears, scratches, holes, etc. 3. 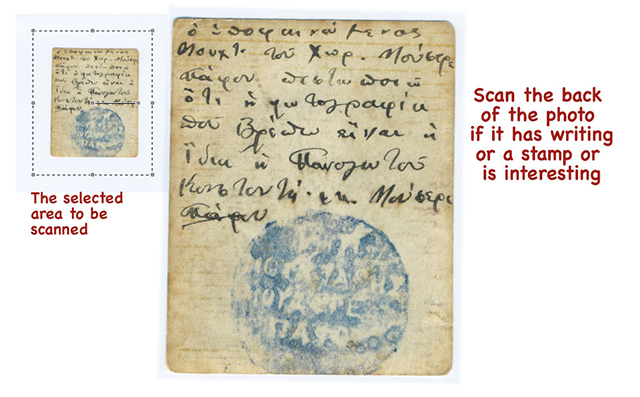 The back of an original photo may have a watermark (postcard) stamp or a hand written message. There may be signs of age such as spots or yellowing marks. 4. Original photos are never glossy but rather matt or have a satin finish. The following example may help you spot the difference. 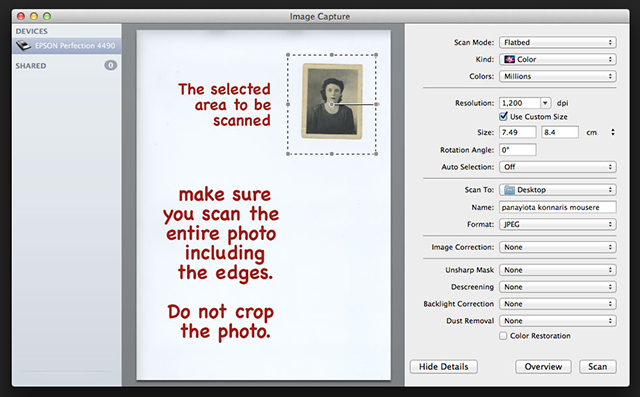 In order to scan and reproduce any old photo to the highest quality possible – you will need access to a flatbed Photo Scanner like the one shown here. Place your photo face down on the glass top of your scanner and click your scanner’s preview button to see a preview of the photo on your screen. You can then use your mouse to marquee (select) the entire photo beyond the edges of the photo as shown in the example below. If the back of the photo is interesting scan that as well. WeTransfer is free and easy to use. All you need to do is attached the folder that contains the scanned photos, add my email address, add yours abd click the TRANSFER button. Simple. 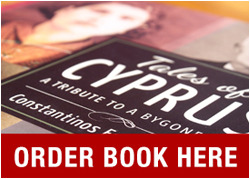 In return for your support and contribution to ‘TALES of CYPRUS’ I will give you and your family full acknowledgement and recognition. I will also send you high quality prints of the scans. Contact me if you need help or more information.